This is a story that is too big to say in one blog post so I'm going to spread it over three weeks. 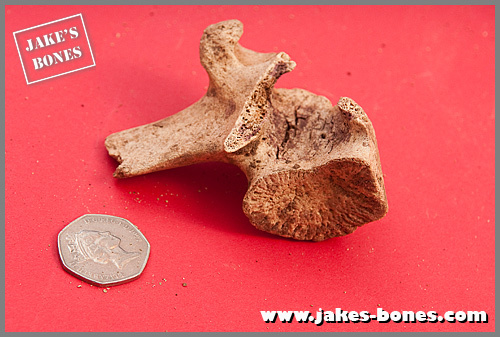 It all began when I got an email from a bone collector called Jen who lives in Dundee not far from me. She said that she was moving to Africa and she had some old archeological bones and asked if I wanted them because none of the universities did. I said yes, definitely, and about two weeks ago she came round to my house to drop them off before she moved and meet me and see my bone collection. 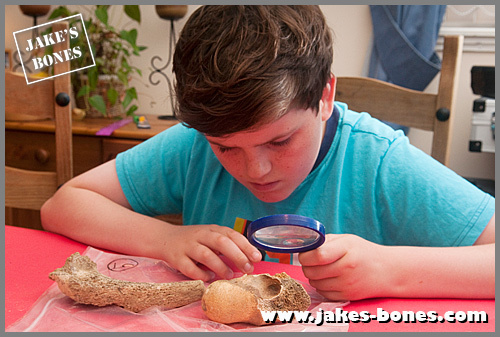 I have never had archeological bones before and I asked some questions about the bones but probably not enough. She said some of the bones were 1,000 years old. 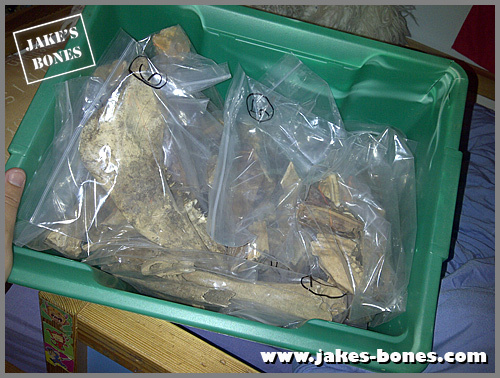 She brought them in a big box and inside the big box there were sandwich bags of different groups of bones. I don't know why the bones were grouped together because some times they were from the same animal and sometimes not. Here is one of the bags and there were 19 overall. 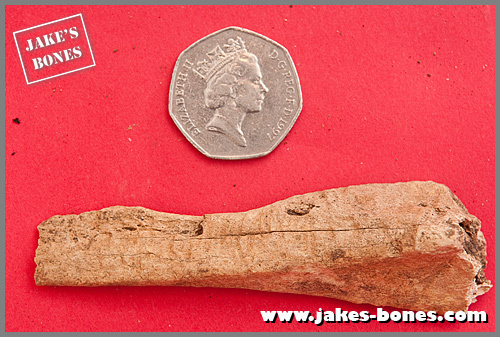 I'm not going to write about every bone in every bag but I am going to write about the ones I found interesting. This week I am going to write about the puzzle bones. 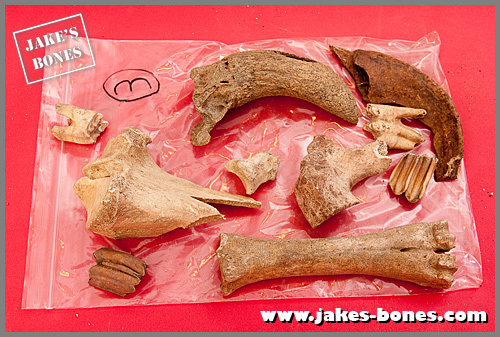 Most of the bones were broken and there weren't many entire bones which makes it harder to identify them. Here are my best guesses as to what things were. ↑ The picture above is part of a skull. There weren't any entire skulls in the case. 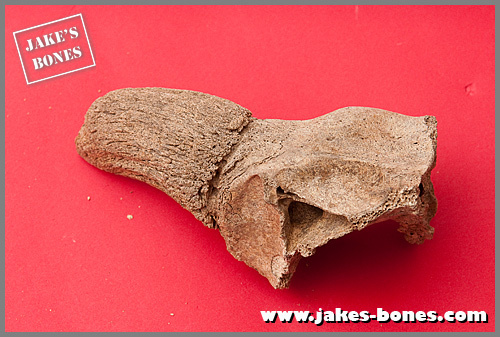 This is a horn core (the bone inside a horn). I think it is from a cow because it is too big to be from a sheep or goat. The core isn't very long so I think the cow was young. ↑ This is another horn core. 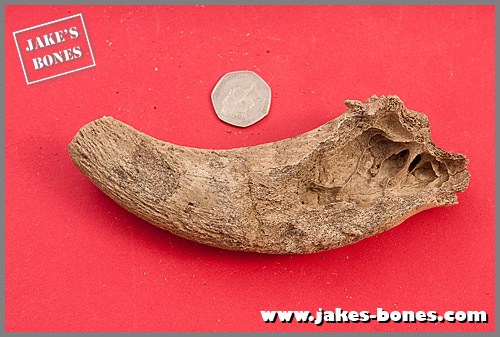 Sometimes farmers cut off horn cores but I don't know whether that happened here. You can see inside the horn core because a bit at the bottom is broken. This would be long enough to be a sheep but it is so wide at the bottom end that it can only be a cow. 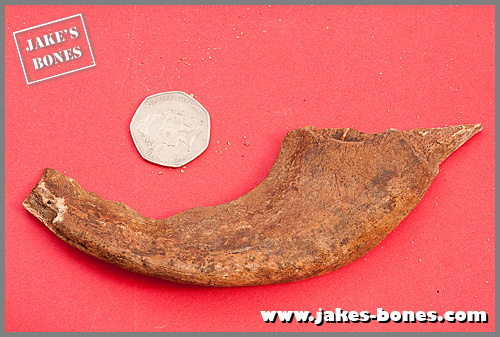 ↑ Horn cores aren't always perfectly round like a banana and sometimes they can be quite flat. This one is completely flat. 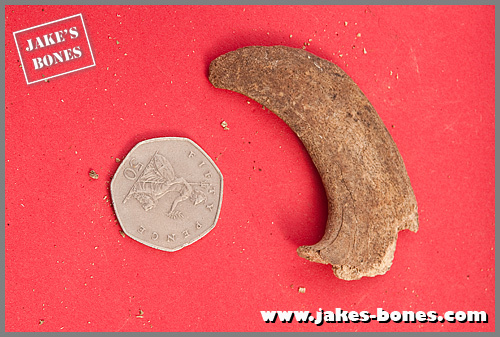 I still think it is a horn core because of the shape but it quite small as if it came off a lamb or baby cow. ...it is this part of a zygomatic ridge ↑ which is part of the bridge of bone which goes from the braincase to the eye socket around to of the lower jaw. 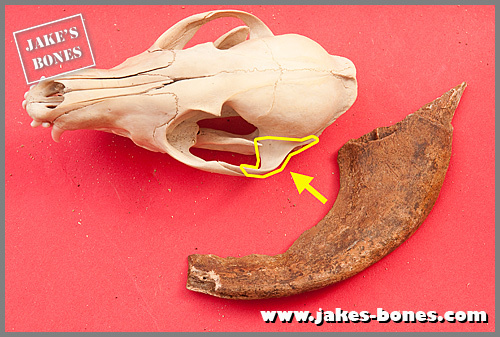 I've used a fox skull as an example because it's the skull which it looks most like, but it is much too big. It looks horse or cow sized but I have looked on my cow and horse skulls and it isn't exactly the same. It might be a horse but I don't think it's a cow. ↑ This one is quite easy. It is a broken vertaebrae which is one of the bones that make the spine. It is from the lower back which makes it a lumbar vertaebrae. You can tell by the shape. 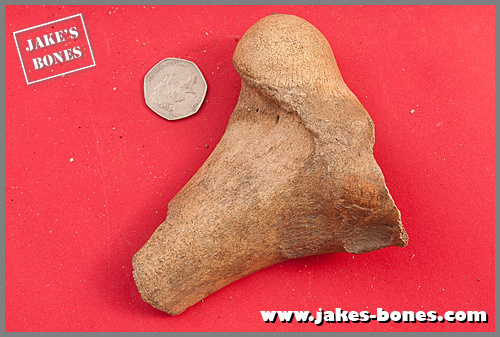 ↑ This looks tricky at first because it looks like a triangular bone but it just the top end of a leg bone. 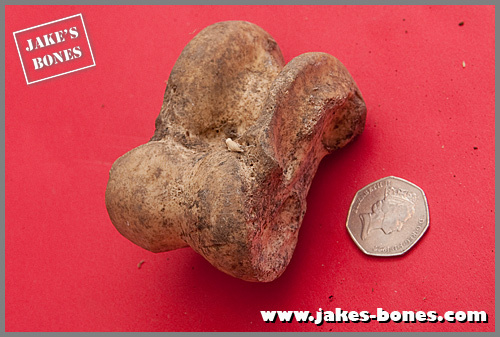 The ball of the top goes in the hole in the hip so this must be a femur. It is so big it must be off a cow or horse. It's the back left leg of the animal. ↑ ...which is what I call the ankle bone but I think the proper name is the talus. 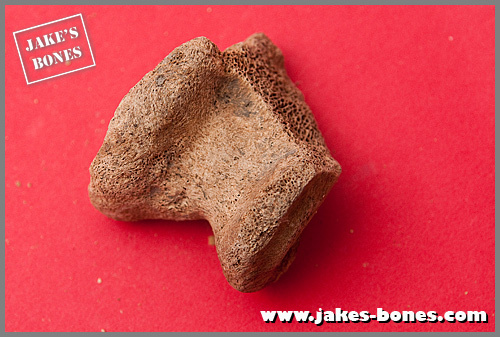 The bone is like a hinge that goes between the tibia and the metatarsal. It has smooth grooves because it goes between them. These two are so big they must have come off a cow or horse. ↑ This one I don't know what it is. It looks most like a tibia but I don't think it is. If you have any ideas, leave them in the comments ! Next week I think I am going to write about a very different type of puzzle I worked on, then the week after that I am going to write about all the teeth that were in the collection. Hi fluffyside. I think you must have me confused with someone else because I don't think we will see each other soon because I don't think we don't know each other or have ever met. I don't think that big flat thing is part of the zygomatic arch, it looks all wrong. Hard to tell from just the picture (I want to hold it!) but possibly part of a rib from a large animal (seem to recall some large cow ribs and elk for example being similar to that). Could it be part of a mandible? Can't really see if the upper edge in the photos is from a break or more natural.